For a sleek and chic look in the kitchen, this set of two black backless counter stools are a fantastic option. 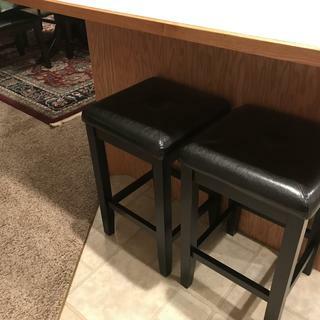 Update your kitchen with this set of two sleek backless counter stools. They come with black faux leather seats with a single button tuft and black finish legs for a handsome and elegant look. The perfect contemporary style for your home. Seat height is 24" high from floor. Seat has a 2 3/4" thick foam cushion. Simulated black leather seat. Hand-rubbed multi-step black finish over solid hardwood and wood veneer construction. BEST ANSWER: The stools are 24” tall, and the seat is 15” x15” very comfortable padding. 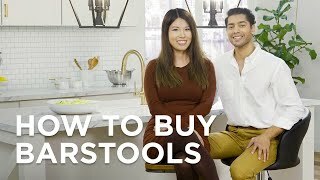 Do Sutton black square bar stools come in color white? BEST ANSWER: Hi Miguel - I am sorry, white is not an available finish option. I liked this color and style for my counter stools, because they work well with my dining room set. They are durable, comfortable, and beautiful. I would recommend this set to family and friends. People ask where I got them, and tell them lampsplus.com! my beautiful new counter stools! This trellis back swivel counter height bar stool has dark brown faux leather seat cushion upholstery for a classic look.